I usually despise military metaphors in political articles, chiefly because of the inaccuracy it engenders. Politics is a process and pretending differently led Brexit to be seen as a moment and not a process. Two years on from the referendum, the ‘battle’ rages on with everyone ostensibly shocked at the prospect that the ‘war’ could be lost with a no-deal scenario. Maybe some pugnacious language is what we now need in our political discourse. Scotland has, in every sense, become a silent ‘battlefield’. There’s an airy indifference among the Scottish electorate to the calamitous performance of the UK Government. A shrug of the shoulders, a heavy sigh. Somewhere, in the distance, the looming disaster of Britain leaving the European Union just doesn’t affect us. There have been a handful of pro-EU rallies across the nation, but no principled resignations in the Scottish Parliament, no defending to the death of Scotland’s 62 per cent mandate to remain in Europe. In 2014, 55 to 45 per cent voted against independence, but it was close enough that it’s still a perennial sword of Damocles hanging over our political chatter. So where is the utter outrage in the streets at the country being stripped of EU membership? After all, there were majorities to remain in Europe in all 32 of Scotland’s local council areas. With that kind of result back in 2014, the independence debate might indeed have been dead for a generation. Fatigue, in all honesty, is the likely culprit. Across the political spectrum, there is widespread dismay, if you’ll excuse the pun, at how ‘Scottish’ political parties have just become northern subsidiaries for their larger Westminster namesakes. Scotland only has 59 MPs and, save for the 35 for the SNP, there’s little holding the remaining 24 together with their own parties fractured over Brexit. 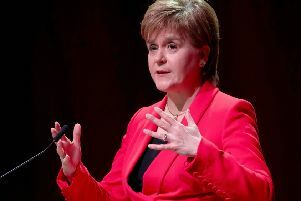 Given how divided the Scottish electorate was over the 2014 referendum result, it’s remarkable – and profoundly telling – that we’ve become so saddled with the expectation of continual upheaval. SNP MPs have fought consistently over Scotland just being hauled along for the Brexit ride, but that frustration doesn’t seem to be in the air among the Scottish public and certainly doesn’t break through the sound barrier to the other 591 Members of Parliament screaming different things. Even those that predicate a justification for a Scottish Brexit on the fact Scotland voted to remain within the United Kingdom cannot be blind to the many factors now at play which could never have been imagined in 2014. A ‘no’ vote in 2014 was, as Ruth Davidson once said, a vote to remain in the EU because of the legal and political uncertainty surrounding an independent Scotland retaining EU membership. The irony now speaks for itself. Perhaps it’s just me, but I’ve spent enough time speaking to people of all political persuasions in pubs, restaurants, and cafes to get a real Casablanca feeling. There’s a ‘war’ on in the distance, but it has nothing to do with us – yet. There should not only be cross-party unity in the Scottish Parliament at the very idea that this country, which voted to stay in Europe, is being dragged out of it, but outright uproar on a daily basis. In May 2016 that existed, albeit briefly, with broad cross-party support for remaining in the EU. Now, save for the daily Westminster tumult and the Lazarus-like qualities of Theresa May, Scotland in her pubs and homes just doesn’t seem to be riled up now as she was then. This nonchalant nature is, partly, due to the feeling that Scotland has little power to influence the debate – we’re lions led by the donkeys of the UK Government. The Scottish Parliament is largely powerless to stop Brexit and we are fatigued after so much hyperbole and drama. You’d never think that the country was about to be dragged through whatever fudge is produced in our name. Even the oft-raised comparisons between Scotland and Catalonia have fallen flat. The affair over Clara Ponsatí, the Catalan academic who had been facing extradition from Scotland to Spain for alleged sedition in the Catalan referendum, didn’t stir up much trouble. There was rightly support for her, but nothing that quite ignited the same passions witnessed in 2014. Something is very much amiss. As a country, we seem to have resigned ourselves to whatever Brexit horrors are coming in March 2019. President Donald Trump’s visit provoked more outcry than Scotland’s democratic deficit in the Brexit referendum. There have been the odd protests here and there, but nothing even on par with the scope of British and European organisations which have banded together to demand a ‘People’s Vote’ for a second referendum. Perhaps Scotland has simply become immune to the constant, hyperbolic language of doom. But the boy who cried wolf only had to be right once. What we need, and need now, is a democratic ‘cavalry charge’, the threat of a second independence referendum from the SNP and a ‘fight’ to the political ‘death’ for the rights of Europeans in Scotland and the hundreds of thousands of Scots who live in Europe. We need to get the fight back into our systems, because, at this very moment, we’re Bogie in the corner of our isolated bubble, wearily saying, “Play it” (again Sam).